One of the better allotment challenges is figuring out what to do with all the food I grow. Some of it’s easy – friends will take bags of veg, we eat/freeze/dry/pickle/jammify a lot and I can fob some off on Mum (not much though or she sends mildly exasperated texts to her friends along the lines of ‘just how much does that girl think I can eat?’ I know she does this. She sent me one by mistake). But I want to store some harvests, like potatoes and squashes. 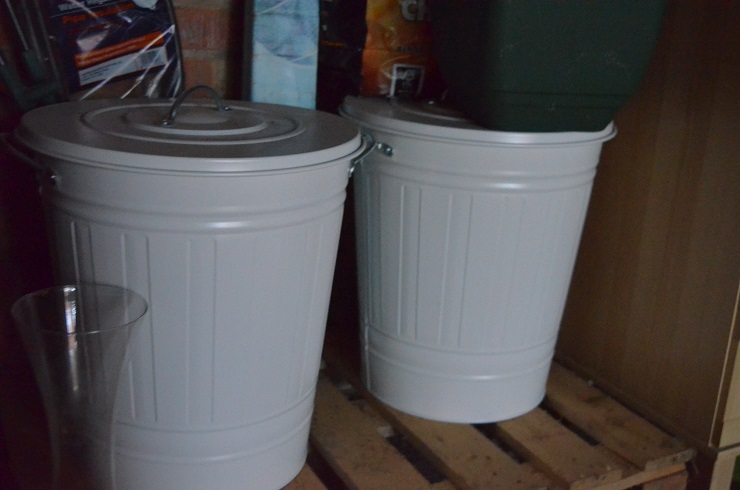 GYO books breezily describe the ease of storing veg in an unheated spare room. But like lots of people, I live in a small, warm flat with very little space to describe as ‘spare’. 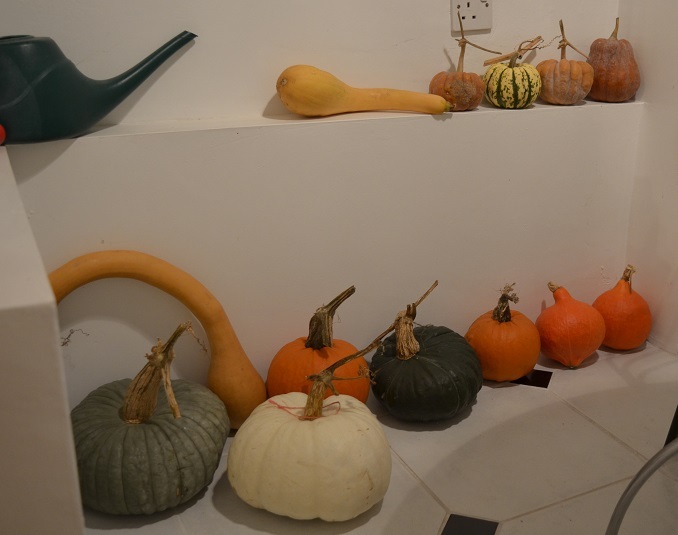 Squashes go on the cool kitchen floor, and potatoes, so far, have gone in boxes in the garage. This year I’ve kept far more than normal and there’s a hitch. My spuds are under attack. 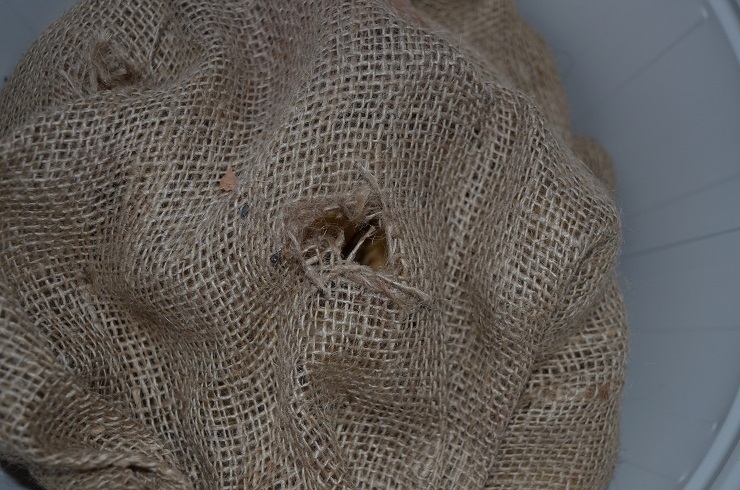 There are holes in the sacks and not insignificant evidence of spud chewing (and poo-ing). I’ve been far too lax in just stashing them in cardboard boxes in the garage and thinking they would be ok. At least one of the local furries have spotted this opportunity and are treating my garage as their local chippy. Something Had To Be Done. Given the huge dusty drifts of junk in the garage, as well as needing to shift another 3 builders’ bags of leaves, that Something involved both a trip to Ikea and hiring a van for multiple tip runs. A (the?) little brown mouse skittered around the garage while I was clearing, probably annoyed that his free dinners were locked up and his house thrown away. I strongly suspect he was living in the cosy interior of the mouldy golf bag at the back. It took 2 days to sort, but now I have a pile of slightly chewed spuds to use up, two new shiny metal spud bins and a beautifully clean, tidy garage in which Maud, my leaky little car, can shelter out of the rain. November, thus far, has been damp, grey and unusually warm. I don’t think my crops quite know what to do. Other than the kale, which marches on unrelentingly. 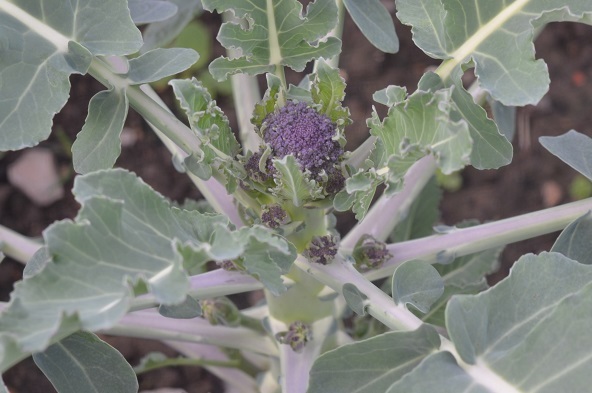 In the green winter bed, the PSB is breaking forth very early, and the incredibly late-planted Brussels have produced marble-sized sprouts. 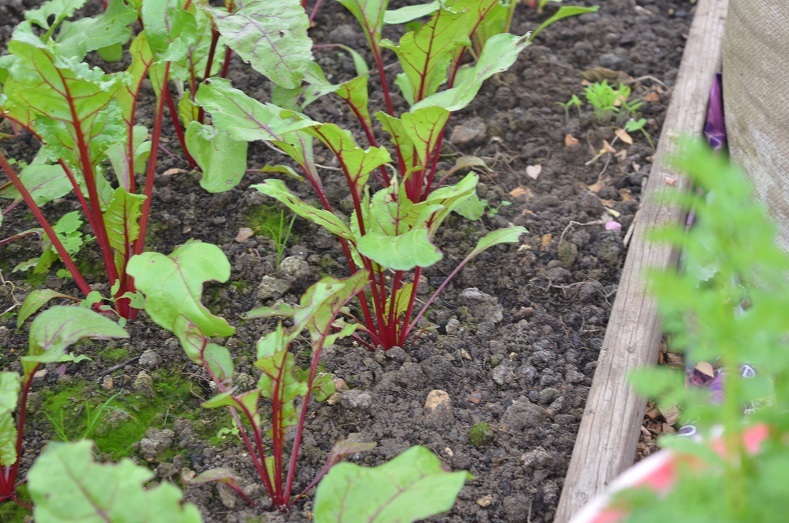 In the greenhouse my experimental beetroot are flying along, and have already overtaken their outdoor relatives in size. 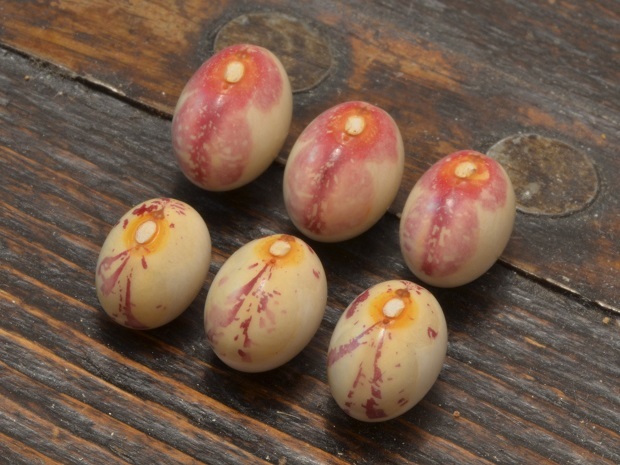 I’m holding off picking the seed circle aubergine until frosts appear on the horizon, though it is now turning a healthy shade of yellow and has gone rock hard. Most of my chillies are picked for seed saving then freezing or drying – the latter will go in the dehydrator but I’m slightly concerned the fumes will be overpowering… Other pickings from the weekend were 4 lovely globe artichokes, turnips, beetroot, the two last trusses of cherry tomatoes , cape gooseberries, raspberries and breadseed poppy seedheads. And I swapped a swede for 2 celeriac. Drying out at home are the last of the Cara la Virgen de la Bañera Leon beans. 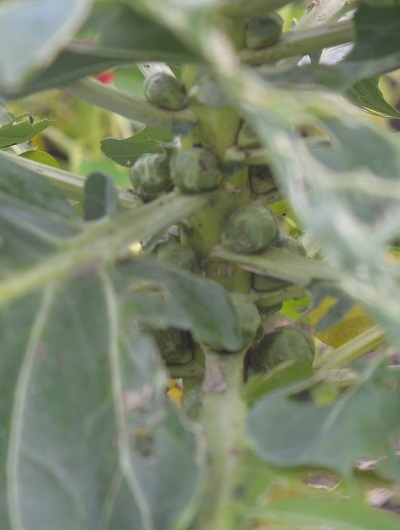 The pods had gone leathery but they are very sloooow to ripen and starting to go furry in the damp so they’ve had to be brought in. They are really pretty when freshly shelled, but, as they dry and age, the red markings fade and the brown hilum markings get stronger. And big news, I have new neighbours! The plastic-covered plot of doom behind mine has been let. They seem very enthusiastic and I hope the plot is good to them. They have at least had full disclosure on the horsetail. It will be great to see it being used again. Sorry about that – putting the buttons next to each other was a bad idea. Is the new plot a start-over or established? Yes, buttons….! I think the great Steve Jobs made a mistake with the iPhone when he put (or allowed) the “m” key next to the delete key, the number of times that goes awry….